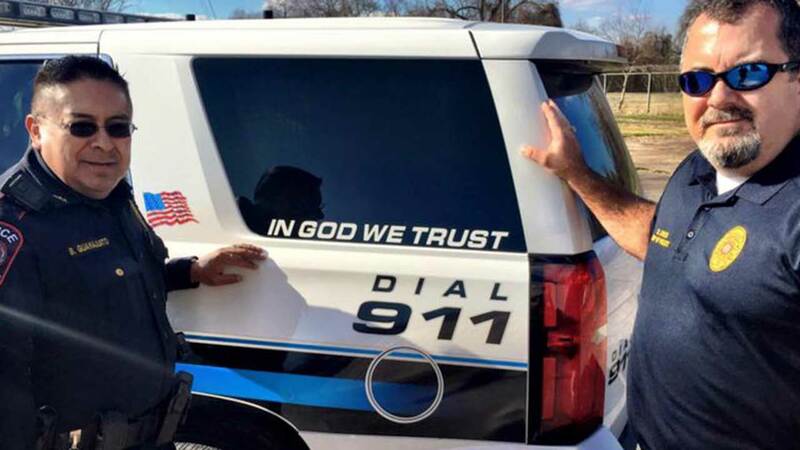 WHARTON, TX (KTRK) -- Another local police agency is rolling out 'In God We Trust' stickers on its vehicles. Yesterday, the Wharton Police Department posted photos of the sticker on one of its vehicles. In the past couple of months, the city of Katy first responders, Liberty County Sheriff's Office and Cleveland ISD police all began showing the same message on vehicles. In their Facebook post, the Wharton PD says the stickers are "Our display is that of patriotism for the amazing country, and community, we willingly serve, protect and if called upon, die for!"